After hours of racing through the desert, Mahra Al Shamsi recites the Quran to her horse to give it strength. Al Shamsi, an endurance horse racer from Ras Al Khaimah, will go to any length for her horse. She competes for Seeh Al Salam stables in 80km, 100km and 120km events, a test of perseverance, strength and strategy for both horse and rider that may last five or six hours. Endurance horse racing has grown in popularity with young women since Al Shamsi, 27, took up the sport five years ago. David Walsh, the award-winning journalist from the Sunday Times who uncovered much of the Lance Armstrong saga, says "it's a big worry when officials outside of racing unearth a drugs problem." He says the Mahmood Al Zarooni case and the ongoing Philip Fenton issue reveal that "Authorities are ambivalent... I don't sense true conviction..."
A Godolphin restructure was inevitable. 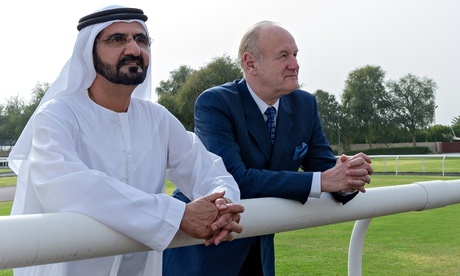 From a small, elite band of equine talent when it started in 1992 under the guidance of Simon Crisford and Saeed bin Suroor, the international stable has mushroomed into an enterprise that spans the world. The equine empire of Sheikh Mohammed bin Rashid, Vice President of the UAE and Ruler of Dubai, goes beyond the Royal Blue silks of Godolphin, which have raced in more than 16 countries. The huge Darley Australia operation and a blossoming presence in Japan is a growing aspect to Sheikh Mohammed’s global outlook. Dubai: Leading military endurance riders from over 20 countries will vie for top honours in the second annual CISM World Military Endurance Championship, which will be held in Dubai next month. After multiple experiences working at some of the world’s greatest sporting events, Mathieu Collet joined the Organising Committee of the Alltech FEI World Equestrian Games 2014 in Normandy on 19 June 2013 as Site Manager for the Exhibition Centre, the Zenith and the Games Village. His role is to coordinate the requests of the Committee’s different departments in order to ensure that the event takes place in the best possible conditions on these 3 sites. With 35,000 visitors predicted in the Village every day, and tens of thousands of spectators expected for the Vaulting and Reining events, Mathieu is a very busy man! Mathieu, which events did you work at before joining the Games adventure? By Lakshmi Kothaneth — There was ecstasy in the air as Gallops of Oman came to a conclusion in the Wilayat of Jaalan Bani Bu Ali’s seashore. The excitement was not just among the winning teams, but each member of the 20 teams as they completed the journey of endurance — crossing 180 km of Sharqiyah Sands. “I think it’s a great success that we have achieved, it has been an excellent experience and organising Gallops of Oman was not easy,” said Brig Abdulrazak Alshahwarzi, Commander of the Royal Cavalry, Vice Chairman and CEO of the Gallops of Oman. They had reached the final stage of 21 km and at the finish line as the riders accompanied their horses to the veterinary doctors; one could see the bond between the riders and the horses that had developed in the last six days. The Mongol Derby — the world’s longest, toughest horserace —boasts its biggest line-up yet for 2014. The yellow-carding of a rugby or football player is, in my view, a sporting spectacle in itself. It’s the sense of anticipation that draws me. One can sense 30,000 bottoms sliding forward on their stadium seats as the referee summons a player after some egregious sin. It is clear what’s coming. The referee is strutting and looking especially officious by this stage. The player receives a brief dressing down and the referee, in a grand flourish, reaches for his pocket and pulls out the yellow card, or possibly even a red card. The FEI has a yellow-card system, too. However, their use does not generate anything like the same drama and spectacle. In equestrian sport, the yellow card is essentially a small yellow form which is printed out and given to the offending rider by the president of the ground jury at an event. No drama. No theatrics. That, my friends, is the FEI way. Arabian horse breeder Carl Fudge has been presented with the Award of Excellence for his outstanding achievements in the sport of Endurance in Canada. Fudge, who is Managing Partner of Sturgeon Creek Arabians, was presented with the award at the Equine Canada Annual Awards Gala recently in Winnipeg, Manitoba, by current Chair for Endurance Canada, Terre O’Brennan. HORSE riders from across the north west will endure 10 and 15 mile routes around a Cheshire forest in aid of Cancer Research on Saturday, March 8. As part of a series of National Rides organised by Endurance GB, riders are being encouraged to enter this event at Delamere Forest whether or not they have done endurance riding before. Six yellow warning cards were handed out, with two riders disqualified, at the 100-mile President's Cup ride in Abu Dhabi on Saturday as organisers finally reacted to global pressure to punish rule-breaking and horse abuse in Middle East endurance racing. Sheikh Mansour bin Zayed al Nahyan, ruler of Abu Dhabi and owner of Manchester City, is understood to have intervened in the clean-up, and been instrumental in the installation of security cameras at vet-gates (vet check) areas and on the “crew” cars following the horses. Representatives of Lord Stevens’ intelligence services company Quest, and International Equestrian Federation (FEI) endurance director Ian Williams were on hand to support officials. The unprecedented move came days after Telegraph Sport’s exposure of horse-beating by a running groom, caught on video at a ride in Sakhir, Bahrain, on Feb 8. The FEI later announced that the rider, winner Sheikh Mohammed Bin Mubarak Al Khalifa, received a yellow card and was suspended. February 16, 2014, Abu Dhabi ~ The HH Sheikh Mansoor bin Zayed Al Nahyan Global Arabian Horse Flat Racing Festival lends support to four Endurance Championships: Portugal-April 25 to 27, France-May 23 to 27, Italy-July 25 to 27, and Slovakia-September 27. Lara Sawaya, director of the HH Sheikh Mansoor bin Zayed Al Nahyan Global Arabian Horse Flat Racing Festival and chairman of the Ladies Racing (IFAHR) gave a press briefing in Abu Dhabi on Sunday, February 16. February 15, 2014, Abu Dhabi ~ Wearing his typical shy smile, Khalifa Ali Khalfan Al Jahouri crossed the finish line in first place with his winning partner Niac Armor for Al Wathba Stables in the CEI *** 160km President of the UAE Endurance Cup, taking home the keys to a car, a custom Rolex watch and a cash prize of Dh300,000 (€60,000). The FEI held an Endurance Conference in Lausanne, Switzerland on February 9, 2014. Representatives from 20 member nations attended, though noticeably absent were members from region VII (Middle East), the nations in the focus of the doping scandals and horse abuses addressed by this conference. The Bahrain incident in which an endurance horse was struck across the rump by support crew as it neared victory in a prestigious 120km desert race resulted in a formal warning to the rider and a ban, the FEI confirmed early today (NZ time). However, equestrian journalist Pippa Cuckson, who brought the matter to wide attention in a piece in Britain’s Daily Telegraph, questioned why the incident resulted in the winner of the event receiving only a warning, despite what appeared to be multiple breaches of endurance rules. The FEI says there is a broad consensus among endurance nations on the future direction for the sport, but views are mixed are whether there should be different rules for the more aggressive distance racing which finds favour in the Middle East. Delegates from 23 countries have met in Lausanne, Switzerland, for a one-day endurance conference, where they showed strong support for most of the recommendations for reform proposed by the Endurance Strategic Planning Group (ESPG), formed after several FEI member nations voiced concern about welfare issues and the worrying number of drug infractions in horses centred on Dubai, Qatar and Bahrain – all members of FEI regional group 7. Germany's Sabrina Arnold top the standings for the Open Riders World Endurance Ranking for 2013. The UAE's Abdulla Ghanim Al Marri was second, with France's Virginie Atger in third. USA's Cheryl Van Deusen ranked sixth. In the Open Combination World Endurance Ranking, Sweden's Maria Hagman-Eriksson and Al Tayar topped the list. Japan's Toshiaki Hirohashi and Lucky ranked second, with Uruguay's Miguel Meireles and EO Shadi third. Two USA riders ranked in the top ten, with Cheryl Van Deusen and EBS Regal Majjaan in fourth, and Melody Blittersdorf and Synthetic in fifth. In the Junior/Young Rider division, Malaysia's Azizatul Asthma Dato' Haji Abdullah ranked first, with Uruguay's Maria Pereira in second and Joaquin Stirling in third. Three USA riders ranked in the top ten: Christina Kimery in sixth, McCamey Kimbler in seventh, and Taylor White in eighth. In the Junior/Young Rider Combination World Endurance Ranking, Uruguay's Frederic Maidana and JQ Zarial ranked first, with USA's Taylor White and Hoover the Mover in second. Chile's Paula Llorens Clark was third. BAHRAIN'S best riders will participate in HM King Hamad bin Isa Al Khalifa Endurance Race Cup, which kicks-off at 7am today at Bahrain International Endurance Village. The championship will comprise two race-categories, the 120 kilometer race (five stages, 30, 30, 24, 20, 16 km) and the 80 km qualifying race (three stages, 30, 30, 24 km). Supreme Council for Youth and Sports (SCYS) chairman, Bahrain Olympic Committee president and Royal Endurance Team captain Shaikh Nasser bin Hamad Al Khalifa praised the organisers' efforts to ensure the success of the race, while he visited the veterinary examinations for participants' horses. The examinations were conducted by international experts at the village yesterday. Abu Dhabi: The Hamdan Bin Rashid Festival 2014 Al Wathba Challenge Endurance Ride (120km) will take place from 7am on Saturday at Emirates International Endurance Village in Al Wathba.